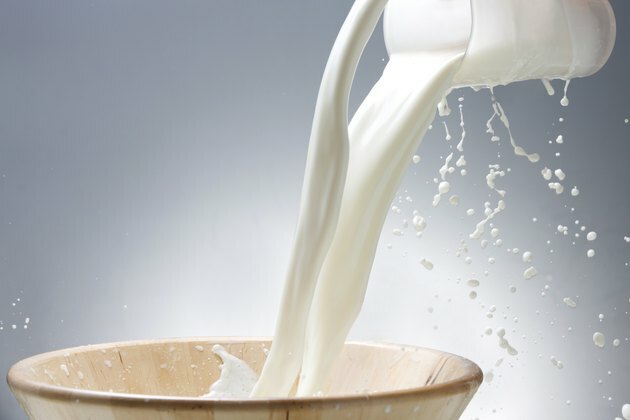 While the pain you're feeling after drinking milk may seem to resemble some of those associated with lactose intolerance, the discomfort in this condition is almost always gastrointestinal. With an intolerance to lactose, drinking milk often triggers nausea, diarrhea, gas, bloating and abdominal cramping. It doesn't usually result in bladder or kidney pain. Rather, this pain may indicate interstitial cystitis. Be sure to talk to your doctor to help determine the exact cause for your symptoms. Interstitial cystitis is an inflammatory condition of the bladder. Although not well understood, researchers think the condition stems from deterioration of the epithelium, which is the protective lining of your bladder. As the epithelium is damaged, toxins in your urine can escape and irritate the wall of the bladder. Irritation eventually leads to inflammation, prompting symptoms of the condition, such as bladder and pelvic pain. Many theories exist to explain what prompts the breakdown of the epithelium. Some medical professionals believe a previous bladder or urinary tract infection initiates the breakdown, while others link it to deficiencies of glycoaminoglycan, a protein that lines the epithelium and protects it from toxins. It may even be the result of a defect in the epithelium itself or an autoimmune disease that causes the body to attack healthy cells. Regardless of the culprit, no cure has been found to return the epithelium to its normal healthy state once the condition sets in. The role milk plays in this disorder is an interesting one. Although your diet doesn't lead to interstitial cystitis, it can trigger its symptoms. According to the University of Miami Leonard M. Miller School of Medicine, dairy can be problematic for people with this condition. It appears that milk, yogurt and sour cream — among other dairy products — can irritate the bladder, causing bladder and pelvic pain as well as more frequent and urgent urination. Treatment often begins with eliminating foods that irritate the bladder. Besides dairy products, you may also need to limit or eliminate caffeine, citrus fruits and carbonated beverages. Foods high in vitamin C can be problematic as well. Other foods are also known to irritate the bladder, so it's likely that you won't suffer symptoms just from milk; tomatoes, onions, spices, nuts, rye, apricots, cured meats and pickled foods can all trigger symptoms. Along with dietary changes, your doctor is likely to prescribe a medication that can help manage your symptoms. Ibuprofen, naproxen, antihistamines and pentosan are just a few of the options. Nerve stimulation and certain surgical procedures may be beneficial as well. Discuss your treatment options with your doctor. Can a Dairy Allergy Make Me Tired? Can Certain Foods Soothe an Irritated Bladder?